It’s been a little more than a week since The Frunchroom and I’m still overwhelmed with all the support for the Alliance’s new reading series. We packed the house at O’Rourke’s Office on April 16th. 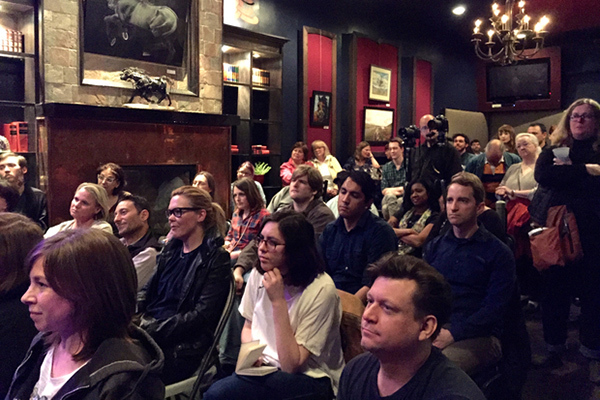 It was standing-room only to hear the tremendous talents of Jen Sabella, Dmitry Samarov, Adrienne Samuels Gibbs, Natalie Moore and Chuck Sudo. Howard Ludwig of DNA Info Chicago was there and filed this report. This quest for balance between local and universal may be what most differentiates The Frunchroom from the rest of the South Side’s live lit scene. I want the Frunchroom to reflect the South Side – its people, its places, its history and its future – and particularly the immediate neighborhoods of Beverly/Mount Greenwood/Morgan Park. But I also want to bring in people from the North, West and East Sides of the city – both to hear stories and read them. Keeping this series accessible while remaining personal will always be a challenge, but it’s an exciting one. Thanks for making our first event such a huge success by coming out and supporting live lit on the South Side. We’ll have audio and video coming soon. Meanwhile, mark July 16th on your calendar for our next Frunchroom event at O’Rourke’s. See you then! If you have questions about the Frunchroom, you can email me: scott at beverlyarts.org.